The mining, processing, and working of metals of all kinds are energy intensive endeavors. Blacksmithing centers around the repeated heating of iron and involves considerable use of fuel. Here at the New Agrarian School we aim to keep fuel usage to a minimum, avoid the use of fossil fuels whenever possible, and use the least carbon intensive fossil fuel sources when they must be used. As well, we endeavor to model forge practices that encourage respiratory health by maintaining good air quality both in and out of the shop. These goals are frankly difficult to achieve in the craft of blacksmithing, however there is great room for improvement from commonly accepted contemporary practice. We believe that with commitment and ongoing experiment even more improvement can be made, and aim to provide a positive model for students and professionals alike. We live in a world where climate change is an increasingly obvious reality. The indiscriminate burning of fossil fuels is at the core of the human contribution to these changes. One of the greatest difficulties inherent in addressing climate change is the fact that fossil fuel burning is so dispersed and ubiquitous. Making changes at a small scale can seem irrelevant. Tracing the effect of any one fossil fuel use to measurable climate change is impossible. But that does not mean there is nothing we can do on a small scale. To the contrary, modeling efficient use of renewable energy sources will not only help mitigate climate change: it will help catalyze good practice for others and help to raise collective consciousness. Additionally, fossil fuels are by their very nature, unsustainable to use. We owe it to our grandchildren and our craft to move beyond the use of fossil fuels and into the practice of truly sustainable energy usage. Here at the New Agrarian School we aim to be part of the transition to a post fossil carbon world. In America today bituminous coal is generally considered to be the “traditional” fuel for blacksmiths. It is widely used by shops of all size, and many teaching facilities continue to depend on it. In fact, the use of coal in blacksmith forges is a relatively recent phenomenon. Coal only replaced charcoal when the labor intensive and centralized mining of coal became widespread, along with economical means to transport the heavy mineral fuel. Charcoal could be economically manufactured locally in forested areas, which included most of America before and for long after Colonial times. In the iron making industry that has been the subject of considerable academic analysis, coal was very slow to replace charcoal as the primary fuel used in smelting and processing iron until the late nineteenth century. That transition had occurred in England more than a hundred years before due to the depletion of forests, the ready availability of coal, and its cheap transport by water. America was quite a different story. The chemical purity and near universal availability charcoal resulted in its long-lived preference for smelting American ores. However, once high quality metallurgical coals began to dominate the iron and steel industry, they were then also widely available for forging in shops not directly associated with the production of iron. Now, with our short historical memories, we consider coal to be traditional. The fact is, coal is the most environmentally harmful of fossil fuels: not just in its burning, but from its mining and processing as well. Even when burned efficiently in industrial settings, is terribly polluting. Burning it releases large quantities of sulfur, mercury, arsenic, and ash, along with tremendous amounts of carbon dioxide. In a typical blacksmith’s forge, the burning is notoriously inefficient, generating copious amounts of smoke and ash. Except in unusually well- designed situations, a considerable quantity of those toxics end up in the smithy itself. While it is well known that one of the primary hazards of coal mining is the contraction of silicosis from the silica in the coal dust, few people consider the fact that coal ash dust from the burning of coal in a blacksmith’s forge is a more concentrated source of this insidious carcinogen…. by a factor of more than ten! Breathing fine silica dust from any source contributes to cumulative respiratory problems. Anything we can do to prevent the generation and exposure to fine silica laden dust will help prevent both acute and chronic respiratory problems. While it is true that in the not too distant past suitable blacksmithing coal could be procured at a reasonable price, those days are past in most areas of America. Coal is downright expensive now, in addition to being filthy. Metallurgical coal suitable for blacksmithing, as burned in the forge is a famously inefficient use of fuel. To start with, some of the coal simply doesn’t produce any heat at all. This includes the water and the ash. And today’s coals are typically higher in ash than those available to our grandparents. Ash varies from source to source, but it ranges from around 6% to 10% by weight in most cases. Add that to the inherent moisture of around 4%, and you can easily see that a significant part of the fuel you paid shipping on is not fuel at all! The burnable components of coal are divided between two major types: the “fixed carbon” (which is what forms the coke in the center of the forge), and the volatile material (which is what makes flame and smoke). The volatile matter in metallurgical coal ranges typically from 25% to 30%. And while this volatile matter certainly contains energy, little if any of that ever gets into the iron bar in a smith’s forge because it burns at the edges of the firepot and makes flame and smoke that just goes up the chimney (or into your shop). That heat is not only wasted, but producing it contributes the lion’s share of the toxics associated with burning coal. After burning the volatile matter, fixed carbon in the form of coke is what’s left….. accounting for a meager 60 to 70% of the original weight of the coal. Of course only a small fraction of the energy from that goes into the iron. That percentage depends on forge design and skill at fire tending. When coal was cheap and abundant and few people cared about air quality or healthy shop conditions, burning coal made sense in the blacksmith’s shop. Those days are long gone, and it is past time to move toward cleaner, lower carbon, and ultimately renewable sources of energy for this noble craft. It is instructive to consider the cost of coal as compared to other fuels. Because solid, liquid, and gaseous fuels come in such different forms, the simplest way to compare their costs is to measure it in cost per therm ( A therm is 100,000 Btu’s). There is some variation in published Btu values for fuels for a number of technical reasons, but here I have done some averaging from different sources in order to establish an accurate basic perspective rather than a precise comparison (which is difficult and not really necessary). Prices vary considerably depending on location, shipping costs and market changes but the following comparisons are useful. Blacksmithing coal for most people in America is available purchased in bags that must be shipped. This is certainly the most expensive way to get it. Group buying can reduce the price significantly, however bagged coal is still quite costly. In some areas coal can still be purchased at the mine for a great savings. I’ve listed representative costs below. As you can see, of the fuels that are potentially useful for blacksmithing, coal is by far the most expensive per Btu except if you live very near a coal mine selling it bulk in suitable quantities. Store bought natural charcoal is also very expensive. Fuel oil, propane, wood pellets, and natural gas are all reasonably close in cost per therm, with natural gas the least expensive. While fuel oil can be used for blacksmith forge furnaces, it is not typically used on a small shop basis. Propane is affordable, convenient, and available everywhere. Wood pellets have been included in this analysis because we believe they have potential in some areas, however we have only done preliminary tests for their use. Price per therm only tells part of the story. None of the fossil fuels can be counted on to be either cheap or available far into the future because they are not renewable. Among those listed above, only wood pellets and charcoal are potentially renewable. We say potentially because depending on how the wood resource is managed, they may or not actually be renewed. However, if the resource is in fact properly managed, then they offer a sustainable alternative to fossil fuels. Not listed above is homemade charcoal because that process, while not cash intensive is labor intensive. The value of that labor is rather hard to quantify. Another important issue in considering the relative value of these fuels is how effectively the inherent calorific content is conveyed to the iron. The problems with coal volatiles and ash have already been discussed. Open coal forges are not a clean or effective way of transferring heat released from fuel to the iron. Neither are those forges good if used with charcoal: possibly they are worse. The effectiveness of heat transfer of the other fuels is directly tied to the efficiency of forge design, and very importantly, how they are used. Since gas forges run continuously, their performance in finished work is very much dependent on how many irons you have in the fire. Coal forges generally cycle according to whether there is iron in the fire or not, and so burn much less fuel when adjusted low while the piece heated is actually being forged. We can say with certainty that a properly built propane forge with a continuous cycling of work through it requires very much less fuel (and work!) than a similarly sized coal forge, and is tremendously more productive in terms of work accomplished. In regard to carbon dioxide contributions to the atmosphere, these fuels also vary considerably. If the forest resources are well managed, then neither wood pellets or charcoal contribute “new” carbon dioxide to the atmosphere. This is because the carbon in the wood was derived from atmospheric carbon dioxide, and returns to the atmosphere. That carbon is in turn absorbed by new growth in the sustainably managed forest. In the case of the fossil fuels, all of the carbon dioxide is, for practical purposes “new”, and therefore contributes to climate change. There are differences in degree however, depending on the relative proportions of carbon and hydrogen. Representative examples of bituminous coal are composed of 80 to 90% carbon and 4 to 5% hydrogen along with other non-combustible elements. Coal is the most carbon intensive of the fossil fuels, and when burned contributes the greatest amount of carbon dioxide to the atmosphere for each unit of heat derived. According to the federal energy administration, bituminous coal emits 205.7 lbs of carbon dioxide for each million Btu’s heat produced from its burning. For diesel fuel the number is 161.3 lbs per million Btu’s. Propane is 139, and natural gas 117. The difference between these liquid and gaseous fuels and coal is due to their larger proportional content of hydrogen, which, when burned completely forms only water. So it is quite clear that choosing either propane or natural gas offers a much more climate friendly alternative. As transitional fuels they are the best candidates. From the above discussion it can be seen that propane and natural gas are not only the least expensive of readily available fuels, but they contribute less earth warming carbon dioxide gas to the atmosphere. As well, they are tremendously cleaner, more convenient, and healthier to work with than coal. While charcoal and wood pellets can be cost effective and renewable under some circumstances, well-designed forge furnaces for burning them are not presently available. Depending on how they are used they have the potential to be much healthier to be around, however they will never be as clean as gas. Working toward the clean and effective burning of wood pellets and charcoal is worth pursuing because, although we can argue about when it will occur, it is certain that burning of any fossil fuel at all will become expensive and ultimately impossible at some point. Preparing for that time by using renewable fuels not only serves to prepare for that eventuality, it also pushes that point farther into the future. 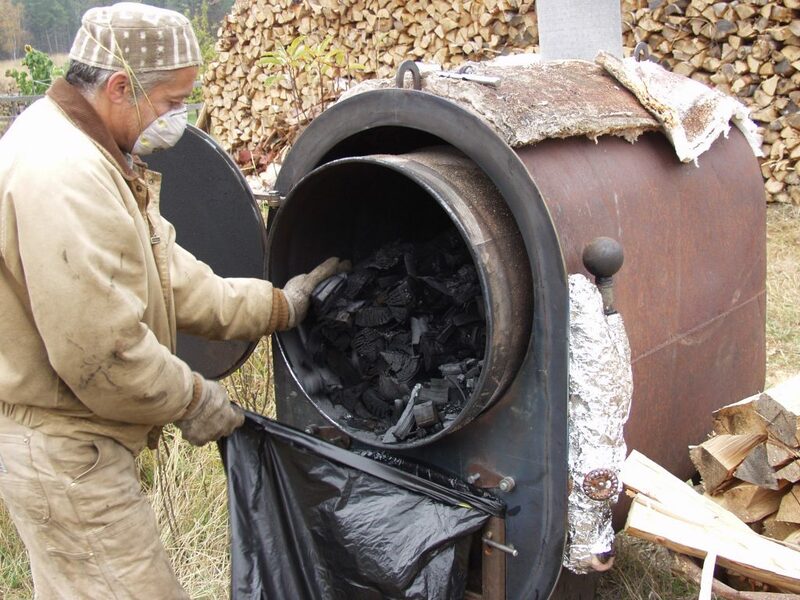 For all of these reasons we at New Agrarian School have adopted a policy of not burning coal in forges, using propane as a transitional fuel, and have committed ourselves to the development of practical and cost effective ways to use renewable fuels such as charcoal and wood pellets.